If you are looking for a slightly quicker way to see as much as Stratford-upon-Avon can offer , is to use one of the Sightseeing Open Air Buses, these buses will take you through the sights and on a sunny day in the open air you can soak up the atmosphere of the bards town. Stratford to Birmingham Experience a trip to Brum reminiscent of times gone by! 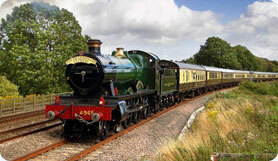 This regular summer Sunday express steam train service operates between Stratford-upon-Avon & Birmingham Snow Hill. Stratford-upon-Avon is the ideal place to get your river legs, you can hire Rowing Boats, canoes, outboard motor boats and other vessels to enjoy the avon. "The Avon winds gently through the town, surrounded on both banks by green parkland and flower filled gardens. The Royal Shakespeare Theatre and Holy Trinity Church, containing Shakespeare's tomb, stand amidst the willow trees reflected in the river's shimmering water." "Bancroft Cruisers is a privately owned family business situated on the beautiful River Avon at The Holiday Inn hotel in the centre of Stratford-upon-Avon near to the historic Clopton Bridge.We are the only river cruise company on the River Avon to offer 45 minute River Cruises with our own on-board crew guide. We also specialise in pre-booked trips, corporate services and school parties"
Bancroft Cruisers offer 45 or 60 minute luxury cruises on a 'walk-on' basis, they also offer a range of group booking options and a cream-tea cruise on the RITA-ELLEN. Find your own Stratford-upon-Avon at the pace of a bike, get quickly from Attraction to Attraction or take a leisure cycle on the Stratford Greenway, a 5 mile traffic free cycle Path starting in Stratford. "Stratford Bike Hire is a cycle hire and cycle delivery service for Stratford upon Avon and the Midlands, including Leamington Spa, Coventry , the surrounding area of Warwickshire and the Cotswolds"